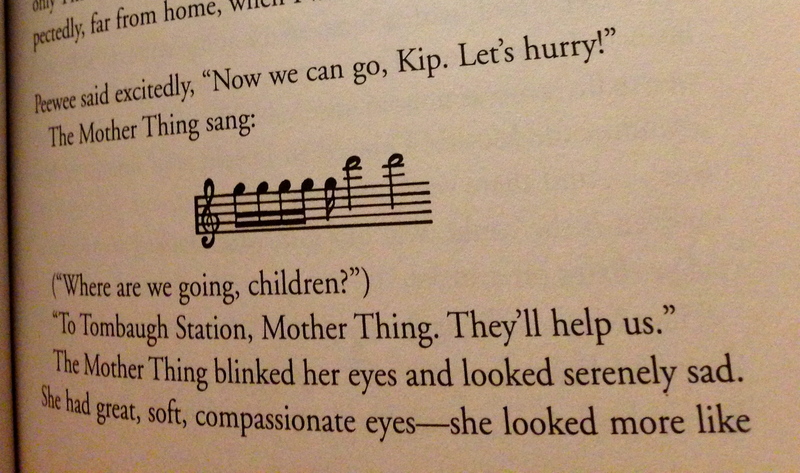 And now it’s time for another round of Music In Books Not About Music! In case you’re curious, previous entries have included Welcome to the Monkey House, All Creatures Great and Small, I Am Legend, Good Omens, A Fine and Private Place, and Have Space Suit – Will Travel. No matter how corrupt, greedy, or heartless our government, our corporations, our media, and our religious and charitable institutions may become, the music will still be wonderful. … It makes practically everyone fonder of life than they would be without it. The book is somewhat politically charged, and veers toward the left, so be warned. If you’re cool with that and/or willing to ignore it, it’s a great, interesting read – one which, no matter where you fall on the political spectrum, you will not always agree with, and that’s always beautiful for sparking a thought or two. If you ever want to see me REALLY ANGRY, all you have to do is mention the movie version of Starship Troopers. I love that book with such a fervor that I am constantly having to replace my copy, as I can’t shake the habit of forcing people to borrow it. Even knowing the return rate on books tends to be poor, I want to spread the love. Thanks! I needed that. Now where were we? Right, Heinlein. I love Heinlein. I love Starship Troopers, I love The Door Into Summer, I am confused by I Will Fear No Evil but love it just the same. And I really love The Star Beast, ostensibly written for children but exhibiting some of the most sophisticated and clever examples of diplomacy I have ever read in a novel. So, having taken great pleasure in his children’s literature, I picked up another: Have Spacesuit – Will Travel. The aliens speak in song! Well, not ALL the aliens; there are several kinds in the book. But the main alien, the protagonist alien if you will, communicates entirely in song, although it is overlaid with something akin to telepathy that allows the listener to understand even if they don’t speak the song-language. 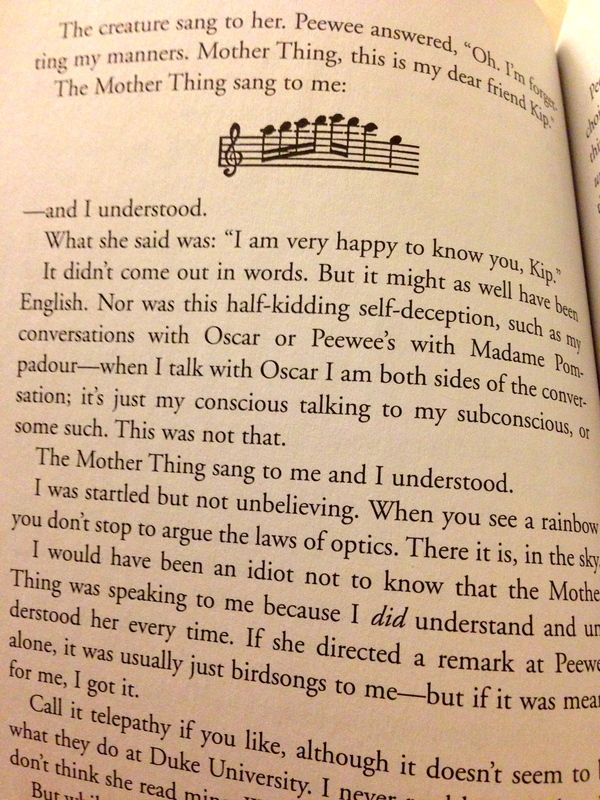 Heinlein stops adding bars of music every time the Mother Things speaks after a chapter or so – gotta save those trees – but every once and awhile it does pop up again, making my want to prop open the book against a piano and figure out what she’s saying, exactly. The whole thing is just begging to be turned into the world’s most avant-garde opera. C’mon, composers of the world, make it happen! 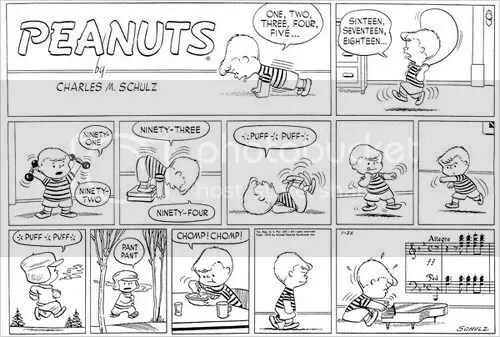 In a strip from 1953 Schroeder embarks on an intensive workout. He does push-ups, jumps rope, lifts weights, touches his toes, does sit-ups (“Puff, Puff”), boxes, runs (“Pant, Pant”) and finally eats (“Chomp! Chomp!”). In the last two panels he walks to his piano with determination and begins playing furiously, sweat springing from his brow. Surely Schroeder himself has kept the pianists — and the pianists’ audiences — busy with his torch for Beethoven. Read the full article here. Note: By the end of this post I will ask you to create your own list of the top ten composers. I’m ruining the ending for you because I think it might be neat if you do it now, before you’re corrupted by my list or the NYT list or your grocery list or what have you. Just a thought. Thank you; good morning! Hey, remember how I said the lynchpin of the Composer Cagematch! is not who you feel is the better composer but rather who you love more? Well, put a pin in it. We’re playing a new game now. A couple weeks ago while at my grandmother’s house my family got into a discussion about who the greatest composers of all time were — greatest, not our favorites. (Yeah, my family has random chats about classical composers — just wait until I tell you about the great Dvorak’s Origins Argument of Thanksgiving 2011. That one still resurfaces from time to time.) My mom pulled up a list from The New York Times music critic to get his top 10. Take a gander here. What I find most interesting about this exercise is less about who made it but who didn’t — or rather, which sorts of composers didn’t. I didn’t name a single composer outside the Austro-Hungarian or Soviet area; nary an opera composer to be found. This is the hole in my classical understanding; this teaches me where I need to go next to expand my repertoire — and maybe revise my list once I have. Well? How do you feel about my list? I expect some fightin’ words as opinions must always create. And what about you? For bonus points, how has your list evolved? If I can remember, I want to make this list up again next year and see if it’s changed. Someone remind me in 11.5 months, okay? * Do you SEE that? Do you SEE how I put Mozart at number 3, even though he makes me want to sic a fictionalized Salieri on him? He’s there because he was a genius, and even if I don’t dig most of his works, I can recognize that. Incidentally, this is also how I feel about Faulkner. Someone left a few old New Yorker magazines on the table in the lunch room at my old job. I found this particular cartoon while flipping through one, and naturally I confiscated it. I think that’s very Wagnerian of me; I expect to be smote by the gods any moment now. Here’s another one of my music-in-literature-that-isn’t-about-music discoveries, or should I say rediscovery because I’ve read Betty Smith’s A Tree Grows in Brooklyn like eight thousand times. If you haven’t read it, you are dismissed from the human race until this situation is rectified. He drew notes on the blackboard; he drew little legs on them to make them look as though they were running out of the scale. He’s make a flat note look like humpty-dumpty. A sharp note would rate a thin beetlike nose zooming off of it. All the while he’d burst into singing just as spontaneously as a bird. Sometimes his happiness was so overflowing he couldn’t hold it and he’d cut a dance caper to spill some of it out. And now I invite you to think about all the good music teachers you’ve had, both in a school and in private, of your instrument and of music as a whole. The ones that loved music so much they gave it to you like an infection. The ones that didn’t just make you try harder; they made you want to try harder. Think about them and tell me about them now, because tomorrow I’m going to rant and rave about the bad ones. Oh yes. I just read Richard Matheson’s I Am Legend, which was, as is almost always the case when you’re not talking about Neil Gaiman, way better than the movie. Without giving anything away, the bit with the dog made me cry. If you’re not familiar with the plot, the basic premise is that the entire human population has been taken down by some sort of plague that has more or less turned them into vampires; one man, Robert Neville, remains fully human. It’s essentially well-written survival horror, which may or may not be your thing, but what I find interesting is that throughout Neville’s post-apocalyptic, fear-driven hermit existence, he plays classical music to help — to fill the silence, to drown out the vampires calling for his blood, a balm for his psychological wounds. He plays Schoenberg’s Transfigured Night, Mozart’s “Jupiter” symphony, Ravel’s Daphnis et Chloe. And then one day he comes across another person, a woman named Ruth. Maybe she’s infected too, but she’s alive, so he takes her in and they talk and listen to Schubert’s fourth symphony. The music ended. She got up and he watched her while she looked through his records…. “May I play this?” she asked, holding up an album. He didn’t even look at it. “If you like,” he said. She sat down as Rachmaninoff’s Second Piano Concerto began. Her taste isn’t remarkably advanced, he thought, looking at her without expression. I have nothing to add to this except: bahahahaha. What music would you take with you in the vampire apocalypse? I am sad because I have this habit of finding great stuff for a topic mentioned on the blog AFTER I’ve mentioned it on the blog. The other day I found a fantastic music gift, and it’s January. I simply do not have the patience to wait till next November to share it with you. So consider this a Valentine’s Day present suggestion, assuming that what you’re trying to communicate is “we share a wonky sense of humor” (good!) or possibly “I am extremely unromantic” (also good if you’re spurning, I guess). You might be familiar with the below, as I understand it has made the viral email rounds and shown up on a variety of musical message boards and the like. It is by the unparalleled humorist and soothing-voiced radio host, Garrison Keillor. 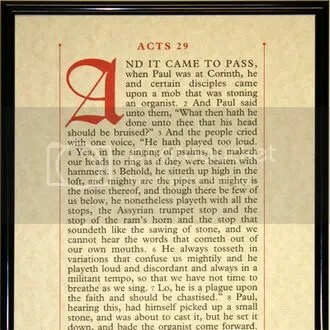 1 And it came to pass, when Paul was at Corinth, he and certain disciples came upon amob that was stoning an organist. 2 And Paul said unto them, “What then hath he done unto thee that his head should be bruised?” 3 And the people cried with one voice, “He hath played too loud. 4 Yea, in the singing of psalms, he maketh our heads to ring as if they were beaten with hammers. 5 Behold, he sitteth up high in the loft, and mighty are the pipes and mighty is the noise thereof, and tho’ there be few of us below, he nonetheless playeth with all the stops, the Assyrian trumpet stop and the stop of the ram’s horn and the stop that soundeth like the sawing of stone, and we cannot hear the words that cometh out of our own mouths. 6 He always tosseth in the variations that confuse us mightily and playeth loud and discordant and always in a militant tempo, so that we have not time to breathe as we sing. 7 Lo, he is a plague upon the faith and should be chastised. 8 Paul, hearing this, had himself picked up a small stone, and was about to cast it, but he set it down and bade the organist come forward. 9 He was a narrow man, pale of complexion, dry, flaking thin of hair. 10 And Paul said unto him, “Why hath thou so abused thy brethren?” 11 And the organist replied, “I could not hear them singing from where I sat, and therefore played the louder so as to encourage them.” 12 And Paul turned round to the mob and said loudly, “Let him who has never played an organ cast the first stone.” 13 And they cast stones for awhile until their arms were tired and Paul bade the organist repent and he did. 14 And Paul said unto him, “Thou shalt take up the flute and play it for thirty days, to cleanse thy spirit.” 15 And afterward, they returned to Corinth and sang psalms unaccompanied and then had coffee and were refreshed in the faith. Funny, right? I know I giggle every time. But it gets better — you can now put it on your wall! And that’s the news from Lake Wobegon, where all the women are strong, all the men are good-looking, and all of the children are above average. Holla! All right, Captain Last Minute of the Procrastinator’s Brigade, you need a music gift you can pick up in a hurry? Most bookstores are open till six pm today. I can think of no type of store more likely to have stuff actually in stock, y’know? Lucky for you, I did an informal poll on Facebook and Twitter earlier this week and collected a small list of good music-related books. Seek these out, and good luck to you! Okay, kids, I’m out till December 26th, when I will post to enable you all to wish me a happy birthday. 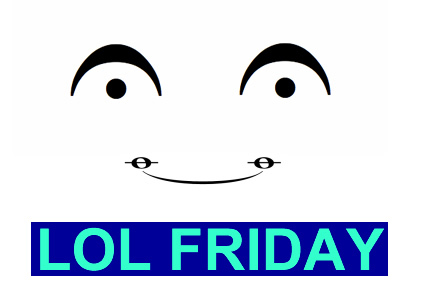 Then the rest of the week I’ll be doing something of a “greatest hits” retrospective, with links to previous posts that you or I seem to be particularly fond of, again on Facebook and Twitter, so you’d better follow/like me now so you don’t miss out. Right then. Merry Christmas, everybody, if you celebrate it, and if you don’t, happy time off for no reason!